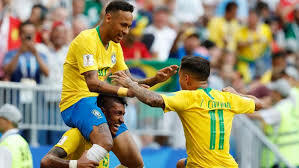 Second-half goals from Neymar and Roberto Firmino have earned Brazil a 2-0 victory over Mexico in Monday’s World Cup last-16 tie in Samara. After a goalless first half, Neymar soon gave Brazil the lead before substitute Firmino put the game out of Mexico’s reach during the closing stages. Tite’s team progress through to the quarter-finals where they will face the winner’s of the tie between Belgium and Japan.